Thanks to the demand for qualified professionals in advanced nursing roles, many schools offer accredited online programs leading to an MSN in a range of specialty areas. For example, American Public University System’s MSN program has nurse leader and nurse educator specializations, while Grantham University offers nursing management and organizational leadership, and nursing case. Other accredited schools with an online MSN include South University, Baker College, West Coast University, Brookline College, and Colorado Technical University. Because MSN programs are demanding and specializations are often limited enrollment, admission is highly competitive. At the minimum, most programs require a statement of purpose that clearly indicates your career goals and specialty area, a 3.0 GPA or higher, a satisfactory GRE score, several letters of professional reference, and a degree (preferably in nursing) from an accredited school. A typical MSN program takes between 18 and 24 months to complete, full-time, with no breaks. 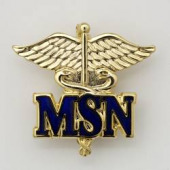 If you are ready to take your nursing career to the next level, enroll in an MSN program today. We’ve compiled below a list of accredited schools with an online master of science in nursing to help you get started.